Here's a quick sneak peak of one feature in the upcoming release. More soon, and the Beta starts next month. This optional calendar display is atop the main collection listing. I see the 4K symbol and I know people will be excited about that. But what is the calendar actually good for? Woohoo... New Beta next month! Merry Christmas to us! I was thinking to myself last week I had a feeling you were going to try for a Christmas release. This preview pic doesn't speak to me much... As I don't do much with pre-releases... but I am sure it thrilled many people. Many of the changes coming in the next release are not graphical in nature. e.g. Atmos support is probably higher on many users list than the calendar view, but it doesn't make for much of a screenshot. Depending on how the calendar works, it might be something I would use. I often see trailers for films I want to see, just not in theaters, and then forget about them once the Blu-ray comes out. If I could add the title to the list and it would automatically tell me once the title has a release date, I would use it. If I could add the title to the list and it would automatically tell me once the title has a release date, I would use it. If you're using Tracker for this, then they will appear in the calendar when they have a release date. According to international standard ISO 8601, Monday is the first day of the week. Fixed US or adaptable? Understood and very true. I can't wait for more tidbits of information. 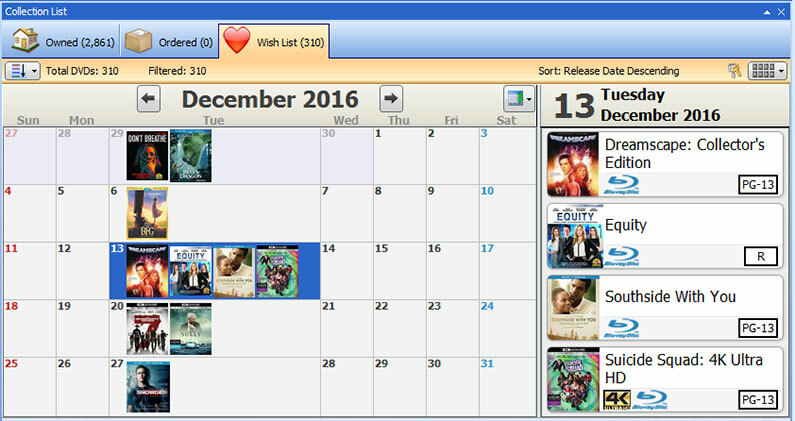 DVD Profiler uses the user's regional settings for calendar display rules. See the calendar drop-down in the personalize window, for example. There are changes to support the new data, but nothing too ground shaking. And yes, all backwards compatible afaik. Hmm, hopefully we have an option to use the official logo.